Sign up for Broadjam today to follow Andrew Bayuk, and be notified when they upload new stuff or update their news! This album represents a culmination of Andrew as a poet and as a musician. 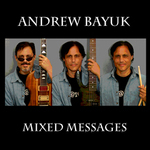 But Andrew Bayuk is not just any musician. His versatility won’t let him fit neatly into any one music genre. Although, he does hover closely over the “folk rock” category and creatively integrates varying influences such as Bob Dylan, Neil Young, John Lennon, Pink Floyd and The Beatles into his own signature sound, this album contains 11 honest and original songs that prove what a lifetime of devotion to your craft can produce - an opus that any musician would be proud to call his own.